As we age, we often want to simplify things and stick with what’s familiar. We see that every day at teleCalm®, where we provide safe phone service to 55+ Active Adults, and also to caregivers who want to set their loved ones up with a safe, stress-free, and cost-effective landline style home phone service. Customers often come to teleCalm after feeling frustration with their existing phone service. Maybe their cell phone is too complicated. Or maybe there are too many scam calls during dinner. In any case, seniors love simple – corded home phones, and are reluctant to give them up. Although we don’t sell home telephones, we have strong opinions on different models based on years of experience serving seniors and listening to our customers. If you want a great landline replacement or home phone for yourself or somebody you love, we want to share the benefit of our experience. We hope you find this review of our favorite senior phones useful. 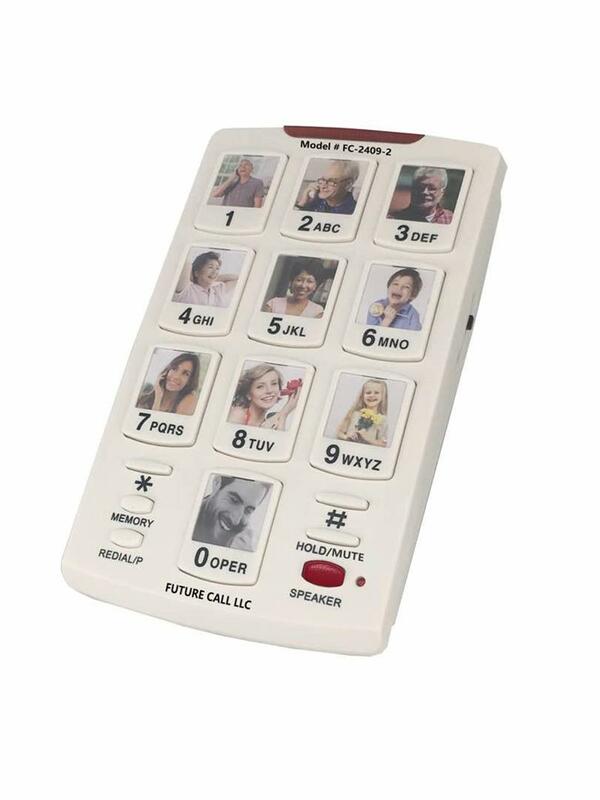 Our customer favorite for dementia, Alzheimer’s and memory care is the Future Call Picture Care Phone. We use two different models extensively at teleCalm; the FC-1007SP with speakerphone and the FC-1007 without speakerphone. These phones incorporate extra-large number buttons that can also hold a photo of family or friends, so your loved one can simply pick up the phone and press a photo to dial. Photo dialing eliminates the frustration of wrong number dialing and having to remember all 10 digits. There is also a red 911 speed dial button on the top. This 911 button is also programmable, which is perfect for Memory Care where 24-hour help is available right down the hall. There is a convenient volume control that provides over 40dB amplification in the handset. These phones are easy to program and easy to personalize with photos. They do not require any batteries or an external power source. All power comes from the phone line itself. These phones can be purchased on Amazon or leased with teleCalm service for just $5/mo (this is the only phone we offer with our service). The FC-1007SP is a perfect complement to our Caregiver℠ phone service. This unique service helps caregivers and families cope with repeat dialing, late-night calls, and inappropriate 911 dialing. It also stops all robocalls, telemarketers and scammers. Our favorite for 55+ Active Adults is the AT&T EL52213 Expandable Cordless Phone with Answering System. With this system, you can choose from one, two or three handsets right out of the box and you can add more as needed. Start with model EL52113, EL52213 or EL52313. This AT&T handset has large back-lit numbers so it’s easy to see and dial (especially if your glasses aren’t handy). Each handset has a great speakerphone – so you can set it down in the kitchen and talk while cooking. A large and easy-to-read display makes it easy to view caller-ID. The answering system offers an ability to screen calls from any handset. When the answering machine grabs the call, you can press a button and listen to the message as it’s being recorded. You can choose to interrupt the recording and answer the call or let it go. If you’re not using teleCalm’s Essentials service, you may be getting a fair number of telemarketer or spam calls, so this call screening feature could be a plus. The AT&T EL52213 is a perfect complement to our Essentials℠ phone service . Essentials automatically blocks bad calls and can notify family if you dial 911. This cost-effective phone service easily moves with you from one home to another. Family caregivers are always looking for ways to make life easier for both their loved one and themselves. Alzheimer’s research shows that keeping seniors connected with family and friends is a major contributor to slow disease progression. Although cell phones from companies like Greatcall and Consumer Cellular are very popular with +55 Active Adults, they can become more confusing and problematic for those suffering from Alzheimer’s and dementia. For some individuals in earlier stages of the disease, common telephones like these can work fine. However, we have found additional telephone options which can help keep loved ones talking as long as possible, while reducing stress for the family caregiver. This also is where teleCalm can further help caregivers by providing a safe phone service with features that help overcome common phone challenges. If your loved one wants photo-dialing convenience but prefers to continue using their own favorite telephone, you can try the Future Call Picture Dialer Box FC-2409-2. This allows you to press the photo and dial the number while using any other phone. This easy-to-install dialer gets all of its power from the phone line and also has a built-in speakerphone.  Are you caring for a loved one? Click to learn how teleCalm Caregiver phone service can help. There is a wide selection of landline-style phones available on Amazon and at your local Target, Best Buy, Walmart, and office supply. Three major brands are Panasonic, VTech, and AT&T. While Panasonic and VTech definitely have a wide variety of models and features, We find that the AT&T phones listed in this blog carry the tried and true AT&T reliability, are simple to use, and provide great quality for the price. The best cordless phones provide a base station with an expandable number of cordless handsets. Each base station uses only a single phone jack to communicate wirelessly with all the handsets throughout the house. This is the perfect solution if you’re using a VoIP phone service like teleCalm, Vonage, or Ooma. Extra phone cable wiring is not required – and each handset can recharge while sitting in a cradle placed anywhere in the home. If you don’t need an answering machine, then the AT&T EL51203 Cordless Phone with up to 5 handsets is the best choice. It has all the great features of the EL52213 listed above, but without the answering machine. This phone can usually be found under $40. This model can also be a great choice for caregivers looking for a straight-forward cordless phone for their loved one. If a corded phone works better for you, we suggest the AT&T CD4930 Corded Phone with Answering System. This telephone has a large and convenient dial pad, plus an extra-large display making it extra easy to read the caller-id display. This phone is hearing aid compatible with an Audio Assist button to boost the active call, and includes an equalizer to allow you to fine-tune the audio to your specific needs. These features alone make it perfect for those with hearing and visual impairments. The built-in answering machine is very easy to use and also supports the call screening functionality like the EL52213 cordless phone model described above. With over 2,600 reviews on Amazon and over 75% of those being 4 and 5 stars, you can’t go wrong with this well-made telephone. The CD4930 is black, so if you prefer white then try the AT&T CL4940 Corded Phone. If you prefer a corded phone but don’t need the answering machine, AT&T’s CL2940 Corded Phone will certainly do the job. This model offers the same extra-large display and large dial pad as the CD4930, plus convenient volume control and Audio Assist.  Tired of robocalls and telemarketers? Click to learn how teleCalm Essentials phone service can stop unwanted calls. If you just need a really easy-to-use answering machine, we suggest the AT&T 1740WH Digital Answering System. This is the #1 Best Seller on Amazon and is easy to find under $20. Perhaps you don’t want anything fancy, just a great reliable telephone that doesn’t take up a lot of space. Well, we all remember the good old Trimline® phone from many years ago. Surprise! AT&T is still making them, and they’re easy to find under $15. The AT&T 210 Trimline phone is available in both White and Black. 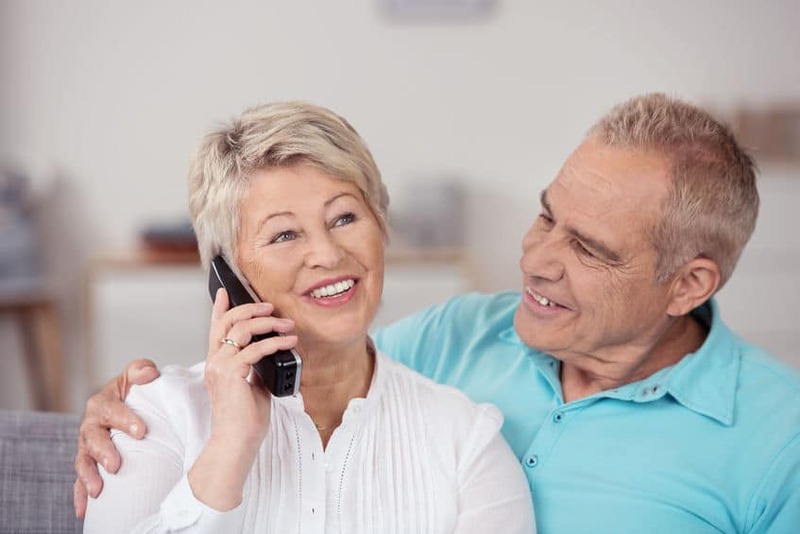 Over the past few years, teleCalm has provided Safe Phone Service to seniors looking for safe, stress-free, and cost-effective landline style connectivity. During this time, I’ve tested more than my share of different telephones as I look for the best choices to recommend to our customers. At teleCalm, our customer’s telephone requirements span a wide variety of solutions. About 50% of our customers could be classified as 55+ Active Adults who want a home phone service to complement their cell phone. The other 50% of our customers are family caregivers caring for a family member with cognitive issues such as Alzheimer’s, dementia, and Parkinson’s. These caregivers need the most effective way to help their loved one stay connected with family and friends – and they need to overcome any challenges along the way. While I’ve titled this review “Best Senior-Friendly Home Phones for 2019”, I realize there is much debate lately whether we should use the word “Senior” to describe the 55+ age group (of which I am a part). I use the term generally here because whether we want to be called senior or not, we end up using the term when searching for solutions. You may even have used the word senior to help find this article. Therefore, for this review, I have grouped phones into two categories; 55+ Active Adults and Caregivers, with some cross-over. I hope you find this review useful. Please do reach out if you’d like to share any feedback.